The U.S. yacht brokerage business ended 2011 not far from where it started, with unit sales slightly lower than in 2010 and the total value of sales slightly higher. 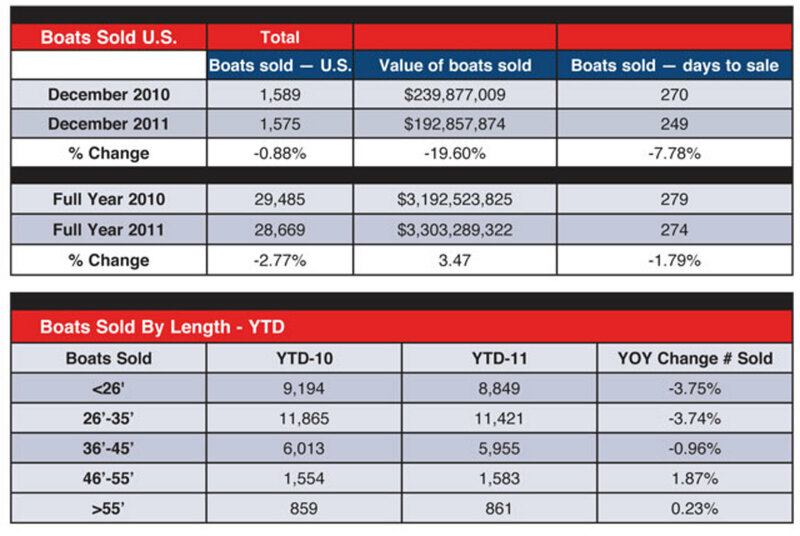 According to YachtWorld.com member brokerages, reporting in their proprietary database SoldBoats.com, 28,669 boats changed hands in 2011, 3 percent fewer than the 29,485 that were sold in 2010. The value of sales rose 3 percent, by $111 million, to $3.3 billion. During a three-year period, brokerage sales have been relatively consistent, ranging from 27,000 to 30,000 boats that sold for $2.7 billion to $3.3 billion. However, the value of sales in 2011 was attributable to stronger sales of higher-end superyachts; in most size ranges, average prices have been slightly lower in 2011 than in 2010. Eighty-one percent of brokerage transactions in 2011 involved powerboats. Power- and sailboat sales declined for the year, compared with 2010; powerboat sales were down 2 percent, to 23,265 boats, and sailboat sales were down 4 percent, to 5,406 boats. The average time it took to sell powerboats and sailboats diverged during the year; the powerboat average decreased from 276 to 268 days and the sailboat average rose from 289 to 296. Breaking down annual sales by length of boat, sales of boats in smaller size ranges declined during the year. Sales of 20,270 boats 35 feet and shorter amounted to a 4 percent decline among the smallest boats. In the 36- to 45-foot range, sales were down 1 percent for the year, with 5,955 boats sold. The only significant growth in sales was among boats 46 to 55 feet, which rose 2 percent, to 1,583 boats sold. Over 55 feet, sales of 861 boats were just two boats higher than in 2010. However, the superyacht subset of that category had higher sales during the year. Fourteen more boats over 80 feet sold in 2011 than in 2010. The increased value of superyacht sales also drove the total value of sales on the brokerage market higher for the year. Although 161 superyachts were sold in 2011, up 10 percent from 2010, they brought a collective price of $739 million, up 54 percent from $479 million the year before. The $260 million increase accounted for most of the gains the market made as a whole. In fact, it was offset by $80 million less total value in sales of boats longer than 55 feet but less than 80. The 46- to 55-foot range was the only other size range that showed growth for the year, a modest $3 million more than in 2010. For the bulk of the market — the three smaller size ranges of boats 45 feet and less — the total value of sales was $72 million less in 2011 than in 2010. The 4.4 percent decrease was slightly greater than the unit-sales decline of 3.1 percent, providing evidence that among these sizes the average price at which boats were sold was slightly lower. The average time a boat stayed on the market declined by five days, from 279 to 274, suggesting that boats were priced more realistically in 2011.